Visit www.cookwithavonmore.ie for recipes for all occasions. Make all your dishes fantastic with Avonmore Light Cream. With all the taste and 30% less fat than regular cream. 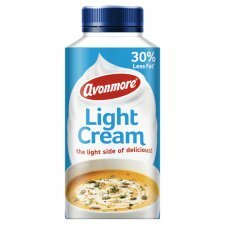 Avonmore Light Cream adds a splash of magic to all your favourite dishes. At Avonmore, we know the secret to delicious dishes is simple, fresh ingredients. Keep refrigerated between 0 and 5°C. Once opened consume within 3 days & by use by date. Use by: Please see cap.